A steam mop may be used to clean sealed laminate flooring. A steam mop is a device used to clean sealed hardwood, laminate, ceramic tile, marble, and stone floors without the use of harsh chemicals. This type of mop is plugged into an electrical outlet so it can heat water added to a vessel on the mop. The water is heated to a degree that will sanitize floors and produce a steam hot enough to break down grease and debris. Steam mops are a popular alternative for those who do not wish to hand scrub stubborn stains and spills. Because they rely on nothing but water, they are also an environmentally-friendly alternative that keep floors chemical-free. The first step for using the steam mop is to add water to the reservoir. Tap water is fine for most mops, but distilled water is recommended for those who have hard water. Once the water has been added, the mop should be plugged in so that the water will begin to heat up. It should only take a few minutes to heat the water, and when it's ready a button or trigger must be pressed to release the steam. If the goal is to sanitize, the steam mop must be held in place for about ten seconds on each spot. That should be long enough to heat the floor to a degree that will kill dust mites, salmonella, and some other types of bacteria. Steam mops usually come with reusable cleaning pads that are attached to the base of the mop. This is where the steam exits and the pads are pushed across the floor to remove dirt. The pads can be tossed in a washing machine and used again. The steam mop functions best as a tool to remove sticky messes, scuffs, and stubborn stains. Steam mops should not be used on unsealed hardwood floors and care should be taken when using the steam mop on sealed hardwood. 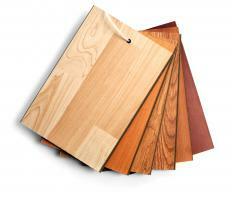 If the mop is held in place too long on a wood floor, it may cause the wood grain to rise. Steam mops may also remove the sheen on waxed floors. If there is a question about whether or not a steam mop will damage a certain floor type, the best course of action is to test a small spot away from main areas of traffic. Cleaning products should never be added to the mop, because they may cause damage to the device. How Do I Choose the Best Floor Steamer? What Is a Steam Washing Machine? What are the Best Tips for Steam Cleaning Grout?